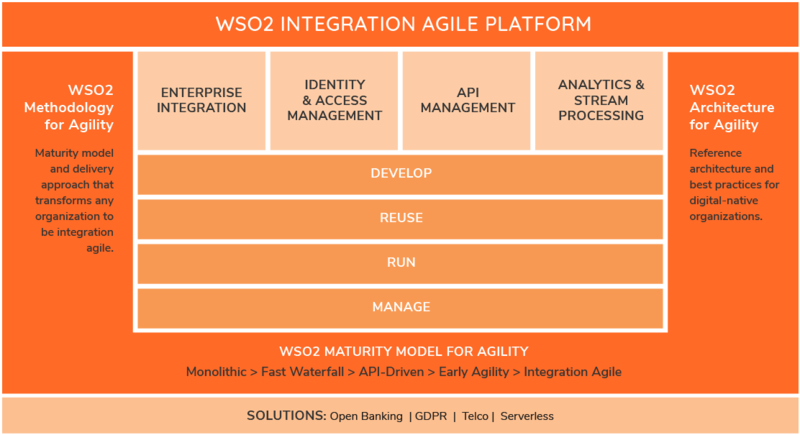 The WSO2 Integration Agile Platform is a broad framework to develop, reuse, run and manage integrations. It's architected around a common code base of fully open source integration technologies. Components can be used individually, or as a cohesive integration-agile platform. The breadth of today's Integration projects is forcing Dev and Integration teams to acknowledge they need multiple technologies to develop, share, run and manage integrations for APIs, data, and event streams. Leveraging different point-products from multiple vendors creates untenable complexity. The WSO2 Integration Agile Platform forms the cohesive architecture needed to help simplify and unify complex integration initiatives. Combined with the WSO2 Architecture for Agility and Methodology for Agility, IT organizations will benefit from a complete set of guidelines that address people, processes and technology. Maturity model and delivery approach that transforms any organization to be integration agile. Reference architecture and best practices for digital-native organizations. Provide quick, iterative integration of any app, data, or system. WSO2 Enterprise Integrator handles over 6 trillion transactions per year. Deploy and apply API design, creation, reuse, analytics and governance. Federated identity, authentication, and authorization for securing integrations. WSO2 Stream Processor handles over 100k events/second. In addition to deploying WSO2 products in a traditional manner, WSO2 offers a cloud-hosted option. The WSO2 Cloud empowers enterprises with the agility needed to support digital business initiatives and rapidly adapt to evolving market conditions. Run WSO2 products on the cloud, where you can take advantage of auto-scaling, self-provisioning, and a full SLA to get up and running quickly.